While this past weekend did eliminate our two A-10 representatives, there is still a team out there A-10 fans may like to get behind. When Derek Kellogg was fired from UMass two years ago, it resulted in a handful of transfers leaving the program. A result that has definitely played a role in the continued struggles of the Minutemen the past two seasons. 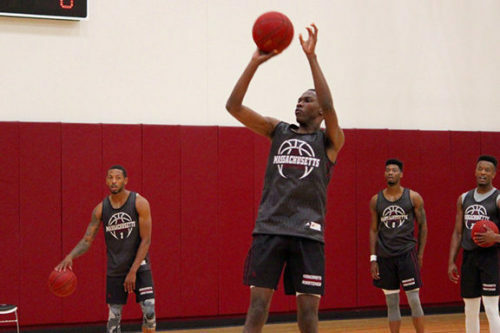 Most notable of those transfers were DeJon Jarreau and Brison Gresham, both of which were significant figures on that UMass team. Both Gresham and Jarreau have been close for quite some time. They attended the same high school in Louisiana, and decided to stick together when they committed to play for Kellogg and the Minutemen. And when they both chose to transfer, it was only fitting that they wound up together again at the University of Houston. This season, Jarreau and Gresham have been role players for the Cougars, as they joined a team led by three seniors. But, this has certainly not stopped them from conveying their talent, especially Jarreau. We had seen Jarreau show flashes of his potential time and time again with the Minutemen, and he continues to do so in Houston, as he currently averages 9 points and 3 assists per game. He also received the award for 6th man of the year in the AAC, again highlighting how important of a player he was this season. And next season, when Houston graduates their seniors, this will be his and Gresham’s team. They will be taking over a team that currently has 33 wins, and a team that is currently trying to continue to advance in the tournament. In Houston’s first round win over Georgia State, Jarreau had 10 points and 7 assists, and his fellow Cougar Gresham posted 9 points as well. It’s interesting to think about what UMass would be right now if Jarreau and Gresham had chosen to stay with the team. It’s fair to argue that they might have been the best team in the league. But that is neither here nor there. The story of these two players is just getting started, and it will continue on Friday night when they take on Kentucky. And while the Cougars do not sport the A-10 insignia on their jerseys, these are two great student athletes to support. It is very rare that you see a bond like the one that Jarreau and Gresham have. Everything they have been through, they have been through together. It took them from Louisiana all the way to Amherst, Massachusetts. From there they took classes at Howard University before winding up where they are now, in Houston. And from the looks of it, it seems that Houston is the perfect fit for the duo from New Orleans. Friday will be a special day for the Houston Cougars, as it is the first time they have made the sweet 16 since 1984. And win or lose, it is important to remember that for Jarreau and Gresham, this is only the beginning of what will be great careers as Cougars.